"One God, one homeland, one enemy, one goal"
Mahmoud Abbas' Fatah announced this morning in a Facebook post that the military wings of Hamas, Fatah and Palestinian Islamic Jihad are "brothers-in-arms," united by "one God, one homeland, one enemy, one goal." One God, one homeland, one enemy, one goal"
The picture shows three fighters from the three organizations' military wings: Fatah's Al-Aqsa Martyrs' Brigades, Hamas' Izz A-Din Al-Qassam and Islamic Jihad's Al-Quds Brigades. 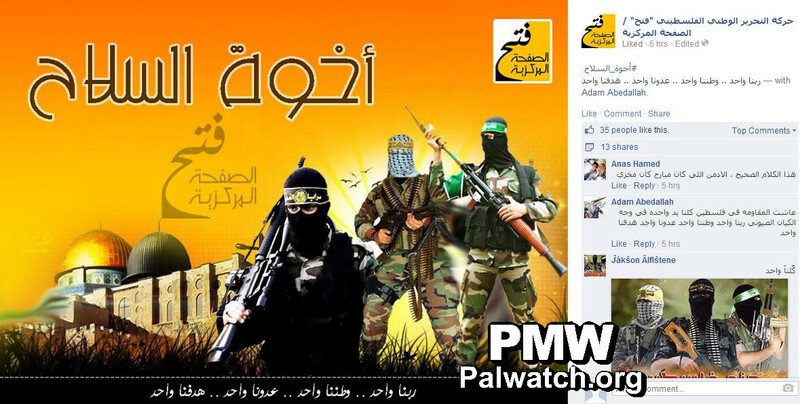 Note: The Facebook page where this item was posted, called "Fatah - The Main Page," is an official Fatah Facebook page. The page defines itself as belonging to the Fatah Mobilization and Organization Commission, and the commission's official website links to this Facebook page. PMW has also reported that in Arabic, Mahmoud Abbas' Fatah and PA often stress that their goal is Israel's destruction and eventual replacement by "Palestine" through a series of stages. The killing of Jews has likewise been promoted by senior PA and Fatah officials.